Sometimes standard just won't cut it. If you need more of a personal touch to your tour, we're happy to help. We organise multi-day tours, point-to-point tours, private tours, circumnavigational tours (for paddlers with BCU 3 qualifications and higher) as well as tours for people with disabilities. How about a private birthday, stag or hen party paddle? Or are you looking for a teambuilding event for your company? Let us know your needs or ideas, and we'll handle the rest. 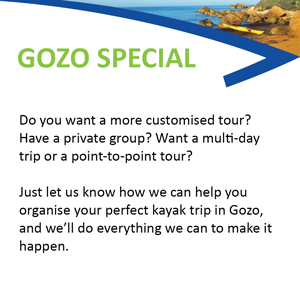 And don't forget, we offer discounts for groups and Gozitan residents. We'll work with you to make everything just right for your special tour. If you need transport on the day of your tour and you book at least one day in advance, we'll pick you up from the location that we have agreed on. We'll provide you with all the kayaking equipment you'll need as well as a dry bag, a snorkel set and anything else we've spoken about. Be sure to bring sunscreen, your sunglasses, protection for your head, a pair of shoes you don't mind getting wet and plenty of water for each person in your party. After the tour, we'll bring you back to where you need to be in Gozo, but this time happier and full of amazing stories! Possible tour/launch points include: Comino Island/Blue Lagoon, San Blas, Ramla Beach, Hondoq, Mgarr Harbour, Mgarr ix-Xini, Dahlet Qorrot, Marsalforn/Qbajjar, Wied Il-Ghasri, Fungus Rock/Dwejra Bay, Xlendi, Qala Point. We do our best to accommodate your wishes, but all tours are weather dependent and will be confirmed at least one day before the tour begins. Kayakers must be at least 8 years of age. Single and double kayaks are available. Contact us for details, options and prices.